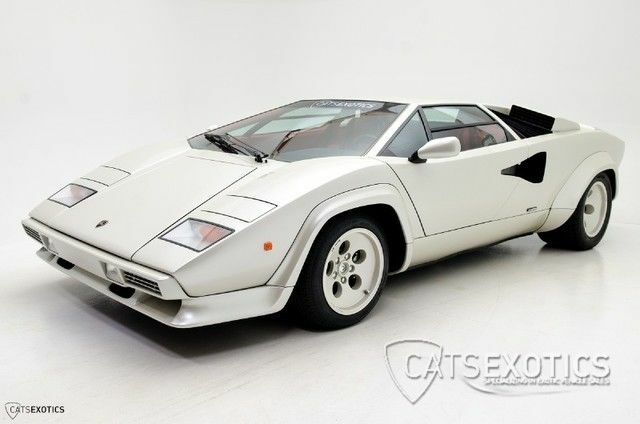 1983 Lamborghini Countach LP5000S 1983 Lamborghini Countach LP5000S finished in Bianco Perlato over Red leather interior. 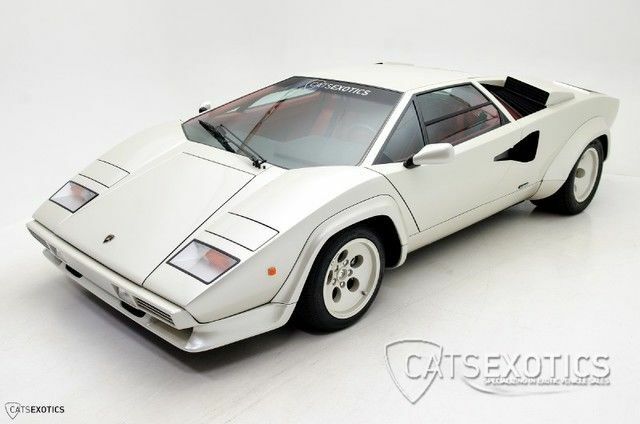 Cats Exotics is proud to offer this EXTREMELY RARE EURO version side draft carbureted iconic Lamborghini LP5000S Countach. The Euro version was devoid of the mandated USA front and rear bumpers as well as the large rectangular side front and back marker lights, making for a cleaner design as intended by Lamborghini. 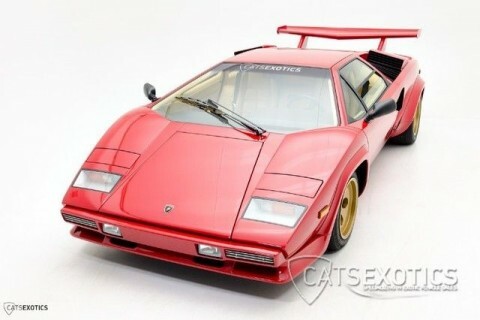 This car is believed to be the 1983 Paris International Auto Show car as verified and documented by the Lamborghini Registry. Brand new this car was sold to a well known USA collector and delivered new to him in Italy. The copy of the ORIGINAL SELLING window sticker is included in the sale! He then had it imported to the USA via the proper and legal methods of DOT/EPA and US Customs. Arriving at JFK Airport via air transport on May 24th 1984. After going through the proper importation process it was released for US use to its first US Owner, a resident of Long Island, NY. It was fully documented on September 17, 1984. ALL US customs, DOT, EPA as well as import documentation papers are included in the sale. 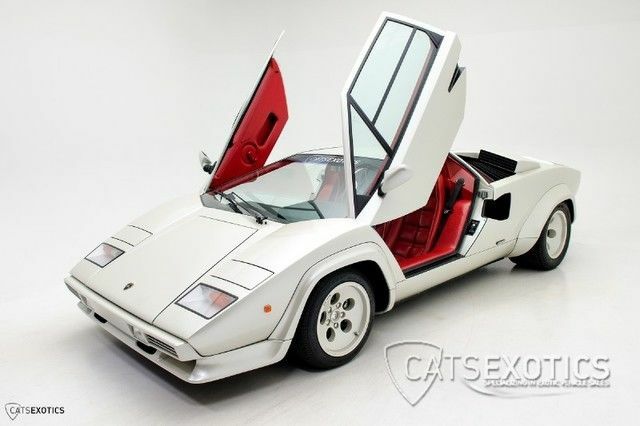 Finished in RARE Bianco Perlato (Pearl White) over its ORIGINAL red leather interior that is in as if new fantastic condition. It was treated to a FULL multi year frame off restoration completed in 2014 with no expense spared. It received both a comprehensive restoration cosmetically and mechanically bringing it to show and concourse worthy condition. It remains in its ORIGINAL EURO specifications with metric calibrated units. All work was completed to this numbers matching as born with ultimate machine using NOS and/or original parts sourced from Lamborghini. The suspension was fully rebuilt, the six original Weber 34DCOE carburetors were fully re-built and re-manufactured with eye to detail by well known Pierce Manifolds. The entire fuel system was rebuilt. The disc brakes were restored and refinished. The instruments were restored as well as all interior lighting and dash appearance. The motor was fully re-sealed by the well known Lamborghini restorer expert Gary Bobileff out of San Diego, California. At the time of the motor re-seal the matching gearbox was completely overhauled as well. The factory headers were refurbished and connected to the optional and rare NOS factory ANSA “Sport” exhaust. The A/C system was changed to the modern R134a which now blows ICE COLD for interior comfort. A fresh set of correct size Pirelli tires were added to complete this fantastic driving machine that goes as good as it looks. Even further RARE is to find this prime example to come with its FULL owner’s manual, service history book found nestled in an original owner’s manual leather OEM book. A period correct post card photo of the period correct delivery Dealership in NY. An ORIGINAL owners key chain of the period, as delivered by the dealers at the time of new ownership acquisition is included as well. An extensive and LARGE binder with documentation of this one of a kind extensive and expensive restoration from start to finish is included with photo documentation as well. Currently only having a low and documented 24,361 miles (39,206 km as seen on the odometer). Truly one of the finest totally complete LP5000S low production vehicles to be offered in the market today.